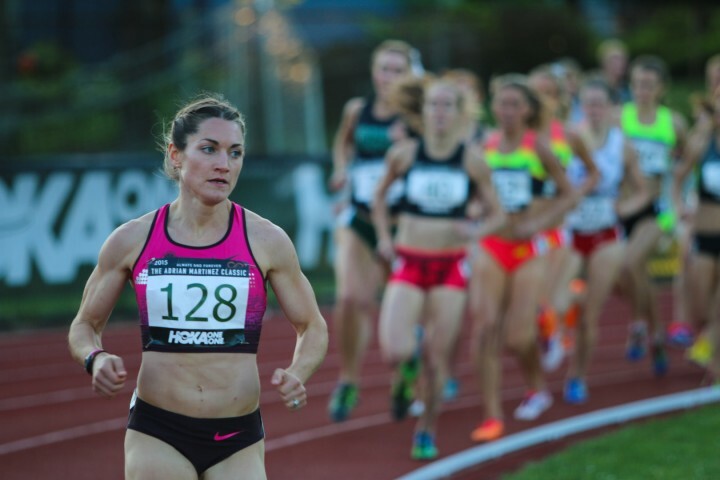 Recovery: 90" rec after each rep.
A week before this workout Anna had just run a personal best of 4:36 for 1500m to win the open section of the Portland Track Festival in 2013. Two years later at the 2015 PTF meet she would run 4:14 for the same distance. That is a significant improvement in a 2-year span for someone in their late 20s. What influenced her ascent? Early on, it was workouts like this. One of Anna's dominant qualities is her power. She is innately strong and fast. However, early on we identified a critical limiting factor to be her aerobic capacity. It wasn't well developed and would compromise her ability to apply her speed in the later stages of races. So it needed to be deliberately enhanced. Otherwise, she'd be out of the race before the bell. However, the aerobic engine takes years to blossom if an athlete is starting from a relatively underdeveloped state as was Anna. For nearly 2 years, building her aerobic capacity was a key point of emphasis as at least 1 out of every 3 workouts would include elements aerobic in nature. This was one of her first session which was heavily focused on stressing her aerobic capacity. It was a lactate threshold ladder of nearly 5 miles of work with drastically incomplete recoveries. The splits show how difficult this type of work was for her initially as the 2nd 1600m and 1200m reps were slower than the first. Often, running too slow relative to the prescribed splits is perceived as a bad thing, but I don't think that is always the case. Context and intent are key. Practice, to me, is a place to try new things, explore, and discover. In practice, you can take risks and work on limiting factors to improve. You can fail in practice and that OK. It is a safe testing ground. Areas of weakness will be difficult at first, but if exposure is consistent, patience is employed, and resolve is firm the learning curve is often exponential. Truth be told, this is one of my favorite and most memorable workouts of Anna's. It was early on in our athlete/coaching relationship, and even though she struggled with the density and intensity of this aerobic workload, her drive and focus shined. Her demeanor and sincerity to labor through challenging work with the sharp intent to get better gave me hope. She showed me that she was indeed serious about transforming herself into the best she could become. And it is her level of determination and dedication to personal excellence and self-improvement which ultimately lead to her 22 second personal best in the 1500m two years later.